Every month Google rolls out new features for G Suite and many of their other products. Some of those updates are irrelevant for teachers and students while others can have a direct impact on how teachers and students use their favorite Google products. 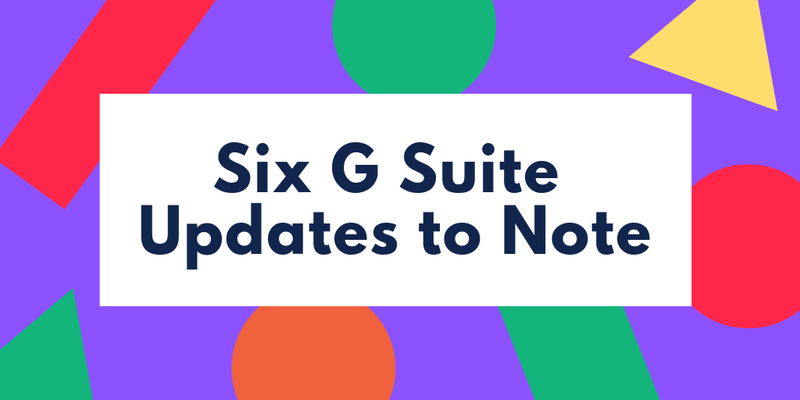 If you want to see every update that Google makes to G Suite throughout the month, follow the G Suite Updates Blog. But if you prefer to trust me to filter and pass along the relevant updates, here's what I think were the Google product updates that were relevant for teachers and students. Insert images into cells in Google Sheets. I covered this update ten days ago. The feature is still rolling out to users. The Google Drive iOS and Android apps were updated. As I wrote a few weeks ago, this change is almost entirely cosmetic. It's worth noting this update because it does change the layout and location of some features. Overall, it's an update that I appreciate because it makes the app's user interface cleaner and easier to navigate. Google is adding a "priority page" to Google Drive in your web browser. When I wrote about this update earlier this month I questioned whether or not Google suggesting which files to prioritize would be annoying. A handful of beta testers of Priority Page wrote to me to share that they liked it. In particular, they liked the workspace function that is a part of Priority Page. Set start times and reminders in Tasks. I'm surprised it took this long for Google to add that feature to Tasks. It has been available in Keep for years. Jigsaw, a Google/ Alphabet subsidiary, launched a Chrome extension called Tune. This isn't a G Suite product, but since most G Suite users use Chrome it is worth mentioning. Tune is designed to help you hide "toxic" comments on social media platforms. I tested it this week. You can read about my Tune experience here. You can now use your own VR tours in Google Expeditions. You can use Google's VR Tour Creator through your G Suite account if your domain administrator has enabled it. Those tours can now be used in the Android and iOS versions of Google Expeditions. I wrote about this update and included tutorials here.